Copyright 2006 SVJ Designs, LLC. All Rights Reserved. Hwy 100 & North Ave.
19 19 comments have been left about this theater. News headlines, site news, and other related articles found in our Journal blog. "Skyfall" Opens in Big-Screen Auditoriums Nov 8th - One Day Early! IMAX Getting Competition from Many Directions - But Are the Alternatives Really Better? 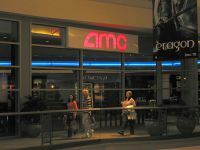 Wauwatosa, WI: AMC Mayfair Mall 18's IMAX Opens Early -- Does It Compete with the UltraScreens? AMC Theatres Offering Movies for $1 During "Summer MovieCamp"
AMC Theatres Offers $1 Movies This Summer During "Summer MovieCamp"
Oconomowoc, WI: A movie theater for Pabst Farms? AMC Theatres Offers Free Movies This Summer During AMC "Summer Moviecamp"
This movie theater is near Milwaukee, Wauwatosa, Elm Grove, Brookfield, Butler, West Milwaukee, West Allis, W Milwaukee, New Berlin, Greenfield, River Hills.